- CLASSROOM CRAFTS - CINNAMON STICK CHRISTMAS TREES BY CHERYL RISTOW, SIMPLY ELEGANT SEGMENTED TREE BY KATHLEEN CARPENTER, PENCIL HOLDER BY EMMY ELLIS, PAPIER MACHE PICTURE FRAME BY SHELLY 2/AR - Teachers.Net Gazette - STRESS RELIEF, STUDENT MOTIVATION, ORGANIZATION IDEAS, CLASSROOM MANAGEMENT, LESSON PLANS, DISCIPLINE, AND MORE - featuring columns and articles by top names in education and your teacher colleagues around the world! The Teachers.Net Gazette is a clearinghouse for teacher writing, from well-reasoned education essays to teacher prose, poems and humor! Bookmark the Teachers.Net Gazette and tell a friend! Pinch off a small piece of floral clay. Roll it into a ball. 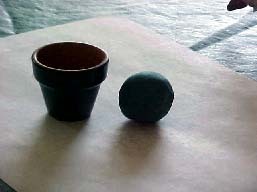 Place clay in pot. Insert cinnamon stick. 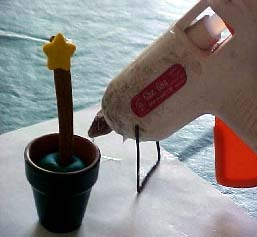 Using a glue gun, glue star to the top of the cinnamon stick. Using a simple over-and-under knot, tie strips of fabric onto cinnamon stick. Trim fabric strips into a Christmas tree shape by cutting each strip a little shorter than the one before it. Glue the small colored buttons to the middle of the cinnamon stick. 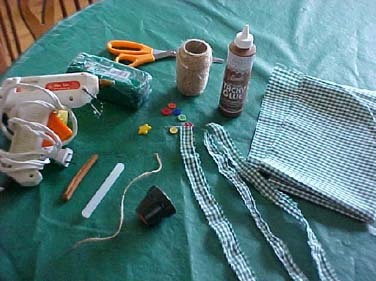 Glue some jute (or ribbon) to the back of the stick to make a hanger. This card project is simple but produces a rather elegant looking effect, even when done by young children. You can use plain green construction paper or jazz it up with foil paper, colorful gift wrap, or any other interesting paper to make the tree shape. 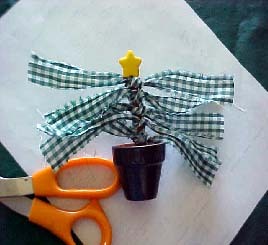 Use plain white or colored construction paper for the folded care or add interest by using special paper for the card. 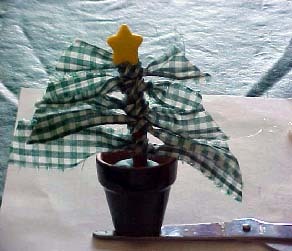 First, make a simple evergreen tree shape, just a tall triangle. The trunk will be added later using another color or texture. The size of your tree shape will depend upon the size of the front of the card. Next, cut the tree shape into horizontal segments and re-assemble the tree by gluing the segments onto the front of the card, but leave a little space between each segment. Keep the spaces fairly uniform in size. For example, cut the top of the tree off the tree shape. Glue that near the top of the card front. leaving space if you plan to add a star topper. Then cut off another slice off the new top, and glue that under the small triangle top. So, you are reassembling the tree but allowing some of the background color to show through. If you're gluing the tree onto white, it will appear that snow or white garland is encircling the tree. If you glue the tree onto gold or silver or another color foil or paper, it will appear that a glittering garland wraps the tree. Use straight cuts, curvy cuts, or cut diagonally for various effects, depending upon the age, ability, and imagination of the students. A gold star sticker at the top is an option. You and your students can come up with other innovations. (Cut shapes from full color advertising flyers, for instance.) If the product is to be generic rather than a holiday card, use nature theme embellishments (cut out pine cone or bird shapes, etc.). Add the trunk of the tree using any medium (crayon, paper, real bark, etc.). 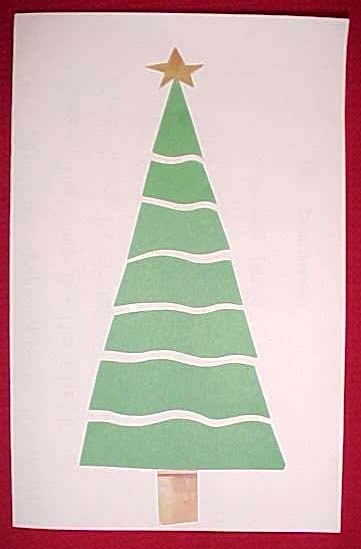 In the basic tree card shown here, the 'trunk" was cut from a store flyer� from a picture of a wooden cutting board. The star was cut from a picture of golden draperies in the same flyer. Wash thoroughly an empty vegetable or fruit can. If sharp edges remain inside rim, cover with tape. Child draws or paints a decoration on the white strip. Wrap the paper around the can and glue in place. Wrap ribbon (grosgrain, etc.) around the top of the can and glue in place. Make a copy of the verse (below), cut* it out and laminate it. (*If desired, cut with fancy edge scissors.) Glue the verse to the top of two overlapping popsicle sticks (end to end to make the stick long enough). The stick (with verse remaining visible above the can) is placed in a little puddle of that instant floral foam that hardens as it dries. Was washed and saved to use again. And made a present just for you. It's for your pencils or your pens. And you can show it to your friends. It's filled with love to you from me. The child's name is signed at the bottom of the verse before it is laminated. [a small photo of the child could be incorporated, either on the stick with the verse, or on the can itself). My son made a neat picture frame this summer at our local museum. It was paper mache'. form on waxpaper in the frame shape of choice. The teacher in this class had cardboard under the waxpaper with a drawn guide for the correct shape. Before it dries, press in buttons, sequins, mardi gras beads, etc. It can be baked on low for a couple of hours to dry, or allow to dry over 2-3 days (depending on size. Ours was 8x10 and took 3 days). When it is dry, glue it onto cardboard cutout for stability. Every year we have parents come in and help us make reindeer T-shirts for the kids to wear at our Holiday Concert. We paint one of their feet brown and have them stamp that onto the shirt. Then we paint both of their hands green to stamp for the antlers. A parent stamps the child's name under the reindeer with red paint and letter sponges. We then glue 2 wiggle eyes and a red pom pon on for the eyes and nose using washable fabric glue. The kids and parents love making these every year! I like to make POPPERS for my students and give them at Christmas time. Fill with stickers, wrapped candy, etc. Wrap in pretty foil papers, or 2 layers of colored tissue paper. 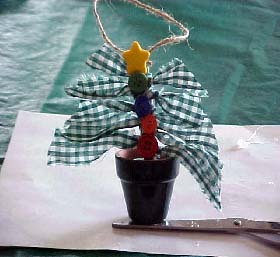 Fasten with a sticker and tie ends with ribbon. They look so festive. Usually I make these at home, but last year, I bought all the stuff and asked two volunteer moms to come in and they spread out all the stuff on the big library tables and made them all. They had a good time, and I invited them to make a few extra for their own purposes. They kept it a secret also. How beautiful they looked!